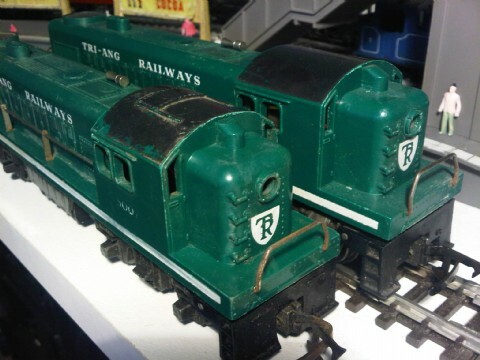 Note: This is the pride of my collection, I obtained this rare one from the US, the owner had it from new with the original freight car set too. Its curiosity value surrounds the fact it has a plain roof, I very rarely see one, especially in the maroon or yellow variants available at the same time. On arrival I cleaned it up and rebuilt the motor, it now runs as good as the day it left the factory. I have put the more common version alongside (although quite rare themselves) to display the difference. I cannot find any other differences between the two.